Australia's iconic actress of the 1970s and beyond, Margaret Nelson, of PICNIC AT HANGING ROCK, CLASS OF '74 and THE LOST ISLANDS. KIRBY'S COMPANY and THE LOST ISLANDS. Throughout our lives, we have cause to remember both people and events. Often we relate those people and events to the decade in which they first leapt into our consciousness. For me the 1970s was ABBA, The Beach Boys, 'The FJ Holden' movie, 'Picnic at Hanging Rock', 'Class of '74' and Margaret Nelson. 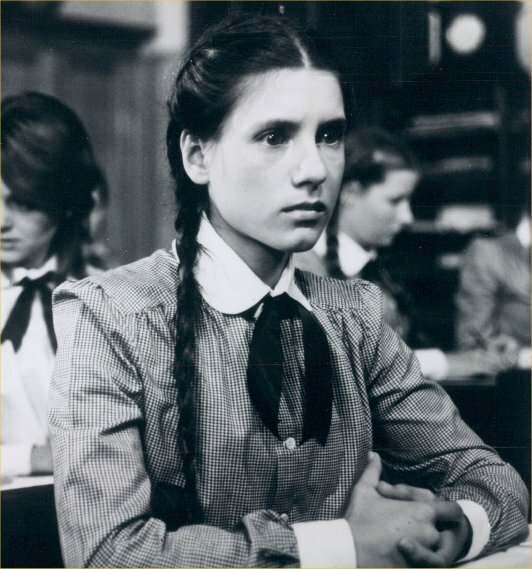 By what some may see as a strange quick of fate, Margaret Nelson appeared in both 'Picnic at Hanging Rock' and 'Class of '74'. The TV series 'Class of '74' provided a launch pad into 'Picnic' for a number of actresses, but for me it was Margaret who attracted my attention. She had about her a naturalness quite unlike any other actress on television at the time. There was a depth to her performances in 'Class of '74' missing from those of the other cast members, at least for this viewer. So I did something not unusual for the time, perhaps. I sat down and wrote a letter to her. It was one of only five fan letters I've ever written. (To answer your unasked question, the other four were to Ray Walston, Connie Hines, Jonathan Harris and Anna Massie). 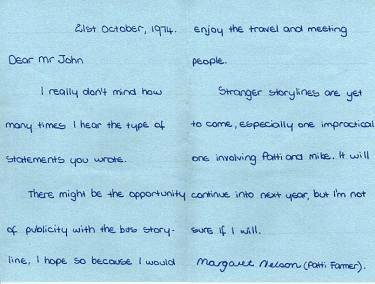 Margaret wrote back to me and yes, it gave me a great buzz. That short letter is still a treasured memory of the period. In 2002, an article http://www.smh.com.au/articles/2002/11/22/1037697872494.html appeared in the Sydney Herald and related newspapers concerning a new edition of 'Picnic'. 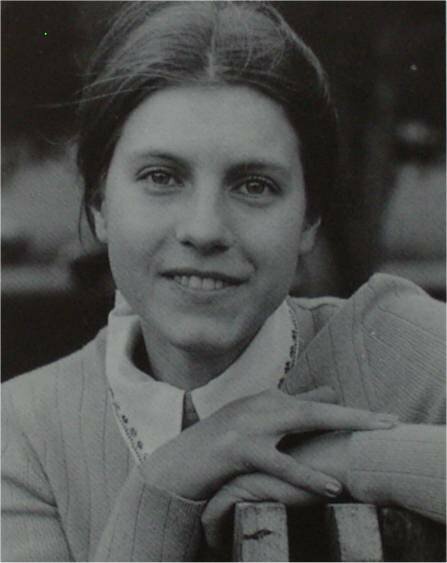 The editor of the book had managed to contact many people connected with the movie but Margaret Nelson remained the notable exception. There was no trace of her. Most likely Margaret married, moved or simply decided she preferred anonymity to a measure of fame, and who could blame her in this day and age? This page will serve as a sourch of information on Margaret for fans of this fine actress. Photos are few and far between. The couple which appear here are publicity photos from an industry publication in my collection. I did write to one of her agents, but the agent was unable to provide any information, apart from surmising that Margaret had dropped out of the acting profession. The one above is from "Picnic". Height (from promotional information) 5ft 3"
Dates of photos top of page: Left, pre-1976. Right, pre-1985. I really don't mind how many times I hear the type of statements you wrote. / There might be the opportunity of publicity with the bus storyline. I hope so because I would enjoy the travel and meeting people. / Stranger storylines are yet to come, especially one impractical one involving Patti and Mike. It will continue into next year, but I'm not sure if I will. COMMENTS RECEIVED - COMMENTS NEEDED. It was nice to see a fan site for Margaret, I became a fan after watching The Lost Islands. They showed Picnic on one of the Sky channels over here just yesterday. I only caught a snippit but she was in most of that. It's a shame that nobody seems to know what's happened to her. Hope you can keep updating the site. Thanks for your response, Ken. Hopefully someone who knows, or knew Margaret, will contact us. Just something I stumbled across and I don't know whether you've seen, but the first episode of 'The Lost Islands' has been posted to YouTube some time ago. Funny, I didn't even think of looking for it. / But it brought back some youthful memories, particularly of that cheesy theme song which now seems strangely reminiscent of the one from 'Gilligan's Island'! How naive we all were as kids! / And, of course, both Margaret and Jane Vallis in the cast. It may be something you might want to link to your dedication page. Thanks, Martin. As youtube clips have a habit of disappearing and moving, anyone who wants to check there for Margaret clips should go to http://www.youtube.com and put "Margaret Nelson" or "The Lost Islands" in the search window. Also, "The Lost Islands" is available on DVD in both European and Middle East countries, but so far not in Australia or other English-speaking countries. I just looked at your website in honour of the brilliant Margaret Nelson. I first saw her in Picnic At Hanging Rock and was quite taken by her beauty and couldn't care less for Miranda (haha). Your website is brilliant and I wanted to thank you for showing the letter she wrote to you, especially great to see her actual handwriting in this age of computers and keyboards. The photos are brilliant too. I recall Margaret from the Young Doctors too and the Lost Islands. I think the Lost Islands series was released before the Picnic At Hanging Rock movie but I seem to only remember seeing her in the Lost Islands after seeing "Picnic". It's a shame Margaret has left behind a relatively small footprint with regards to film & movie print and it would be wonderful to know her whereabouts and what she ended up doing all these years. I hope and pray she is still with us. Good to hear from you, Marty. I found your Margaret Nelson dedication page when looking around Google for PaHR references and wondered if you might be interested in my new novel, which I have titled, "Dream Within a Dream". The character of Sarah appears again in my story, inspired by Margaret's wonderful performance. It would be good to know that she is still around and well, enjoying a quiet life in suburbia (if that was what she wanted!). It seems that interest in PaHR is alive and well and the mystery continues to capture our imaginations. In my case, it actually inspired me to write! 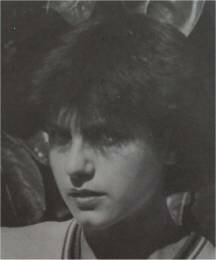 On a sad note, were you aware that Christine Lawrance nee Schuler ("Edith"), died in Adelaide last year? Thanks for your information, Michael. I've linked your title to Amazon. This is an unofficial fan page only and does not intend to infringe any copyrights or privacy. If you have any concerns, please contact me as above.